In this installment of StraightTalk, we will explore another important topic to making a business architecture practice successful: business politecture. Yep, that is business architecture + politics = business politecture. This post is the bookend to No. 34 on business marketecture, both of which remind us that there is more to introducing business architecture to an organization beyond the models. Business politecture is the careful handling of the challenges that arise with the introduction of business architecture to an organization. Introduction of the business architecture team – This results from the existence of a new business architecture team, and includes adoption challenges related to getting people to use the business architecture, other teams to partner with the business architecture team and leaders to invest in the practice—primarily because they do not yet understand. Believe it or not, this can be the easier of the two to manage. 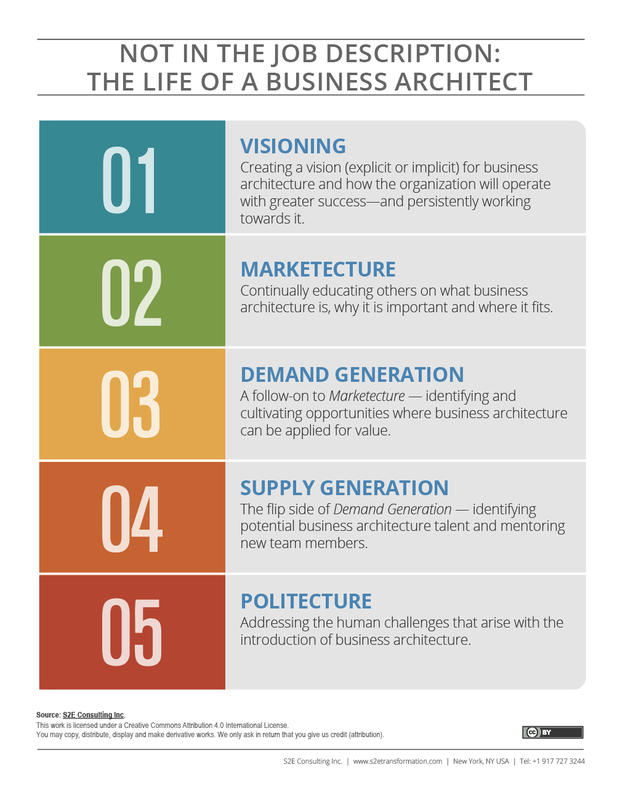 Application of the business architecture discipline – This results from the usage of business architecture over time and the mindset shift that goes along with it, which requires new thinking and behaviors to do what is best for the enterprise, like collaborating across business units and making different decisions about where to invest based on the objective big picture. This includes adoption challenges related to getting people to use the business architecture for increasingly larger and more important scenarios—primarily because it requires them to act differently. This one may not show up right away but is the more serious of the two to manage since it is related to a much deeper level of change. What are some examples of situations where business politecture is needed? “I don’t want to engage in this business architecture stuff.” – Comes from individuals with a whole range of resistance types (e.g. reluctance to participate as a subject matter expert to develop the business architecture or reluctance to use business architecture as part of their role) and for a whole range of reasons. “I don’t want to partner.” † – Comes from individuals within related teams who do not yet understand business architecture, do not want to change or see it taking some of their power away (e.g. strategy team members who are used to defining initiatives without the business architecture translation in the middle or business analysts who are used to doing all of the upfront work with the business versus consuming business architecture as input). “I have a better way.” † – Comes from individuals within related teams or otherwise who believe they have a better framework or approach, again because they do not yet understand business architecture, do not want to change or see it taking some of their power away (e.g. an individual who created an alternate capability map-like structure that gained traction or a business process analyst who feels business architecture is replacing some of their role). † When defined correctly, business architecture never overlaps or competes with other teams or disciplines. These concerns are usually a function of misunderstanding. Post No. 5 has you covered for the details on how the business architecture team integrates with others. Why do we have to deal with business politecture? Because we are introducing change. This is all about the human stuff. People react for all sorts of reasons: because they don’t understand, because doing things differently requires more work or requires them to do things they don’t want to do (e.g. be transparent, be accountable, make decisions or pool funding with other business units, etc. ), because they perceive a loss of power, because they feel they have higher priorities, because they wish it had been their idea, and on and on. If you thought the business architect role was just about the models, remember that the change business architecture makes is much deeper than that (and thank goodness). At the end of the day, our impact is about much more than the business architecture itself—it’s about a new vision for strategy execution and working together as an enterprise. The existence of business politecture is a good indication that you’re doing your job well to lead the organization to a more effective and agile state. In addition to politecture, here are a few other important things business architects do—outside the job description. How do we recognize business politecture? Sometimes the resistance is overt, like when someone tells you that they or their team will not be participating in your upcoming business architecture development sessions because they don’t see the value. How can we succeed at business politecture? Be proactive – Do the work upfront to socialize the practice, build partnerships with other teams and integrate business architecture into the fabric of the organization. Good communication and outreach can head off many challenges and conflicts before they happen. Enlist help – When things get really challenging, escalate the issue to your leaders and enlist your business architecture advocates to help you work through a challenge head-on. Who is responsible for dealing with business politecture? The leader of the business architecture team (and their leaders) will likely handle the majority of the really tough conversations and the politecturing so that the rest of the team can focus on the architecture and delivering value. However, at a minimum, every team member should be comfortable describing the business architecture discipline, its value and its intent—and some may indeed have to deal with politecture as part of the initiatives they are working on. Closing Thoughts: Shout out to all the business architecture teams who tirelessly work through challenges and business politecture to start, grow and sustain the business architecture practices within their organizations. Here’s to you. You make the discipline real and make your organizations better every day, one step at a time. Why Organizations Don’t Learn (Harvard Business Review): A few deeply ingrained human tendencies to be mindful of that interfere with learning (and changing), along with how they can be countered. Carol Dweck: A Summary of The Two Mindsets And The Power of Believing That You Can Improve (Farnam Street): Great stuff here on human motivation and mindsets, and important considerations when introducing change. Where’s the King of the Ants? (Seth Godin): This blog post reminds us that culture is a powerful force available to us—and we create it. 15 Things Highly Confident People Don’t Do (Lifehack): A good list to inspire you to just do it when it comes time for the hard conversations and actions. Lead and Be the Change (TED Talk): Mark Mueller-Eberstein speaks on the Theory of Transition by revealing that emotions such as denial, anxiety, fear, and confusion can eventually lead us to discover new opportunities in the transition, by where we can become excited and strive for change, not only for ourselves but everyone around us.